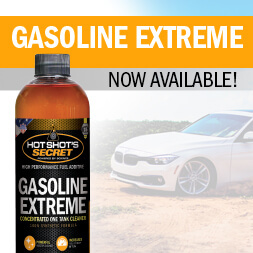 Hot Shot’s Secret STICTION ELIMINATOR has been saving diesel engines since 2004. Its ability to provide superior cleaning and boost lubrication properties of the host oil make it one of the only multipurpose additives available today. 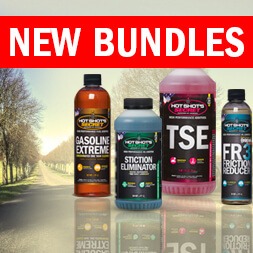 Over the years, this one-of-a-kind product has been reformulated in order to remain the best possible solution for removing the layers of stiction that robs engines of power and create excessive wear over time. The most recent development to the STICTION ELIMINATOR formula has provided an opportunity to resolve issues related to high performance gasoline engines. Similar to diesels, constant friction and extreme temperatures inside these high performance engines will result in a burning effect of the oil causing a layer of oxidized oil and its additives to form over time. Although stiction is certainly an issue in high performance gas engines, oil consumption and turbo life also haunt the owners of these vehicles. Hi Steve, sorry for any confusion. The same product/item number is and has been applicable for both diesel AND gas engines. Thanks! Looks like definitely Tractor Supply and some truck stops. If you’re looking for Stiction Eliminator specifically, some Walmarts have it now! The ads always talk about injectors, will it help an older carbureted engine? I rebuild ’50’s trucks with original engines. Yes absolutely Chris! It will clean everything the oil comes in contact with, safely and effectively throughout the oil change interval. 4.8qt w/filter on my 2.1L vw engine,how much do i use of stiction eliminator per oil change and at what interval i.e. at every oil change or? Hello Stephen, the Stiction Eliminator is formulated and tested to work with ANY oil, including a 20w50 high zinc. It is much less a solvent, and more designed to break-down stiction on the molecular level and safe for the entire oil change interval.